Signed and dated l.r. corner, brown oil "F McCubbin/ 1896". 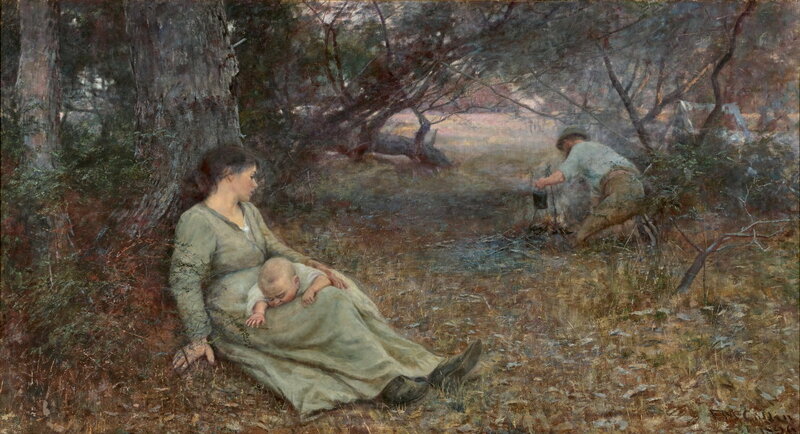 A.C., Age , 'Australian artists of the past: Frederick McCubbin', Melbourne, 26 Nov 1932. 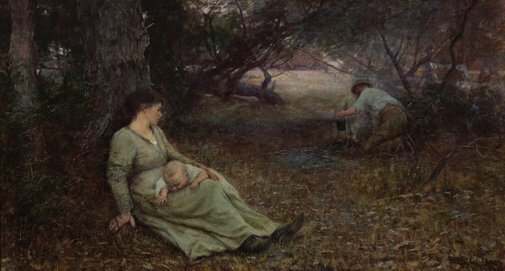 Leigh Astbury, Australia 1888: a journal for the study of Australian history centred on the year 1888 , 'Frederick McCubbin: the spirit of the pioneers', pg. 26-58, Melbourne, 1982, 38-40, 43, 45. Leigh Astbury, La Trobe Library Journal [vol. 6, no. 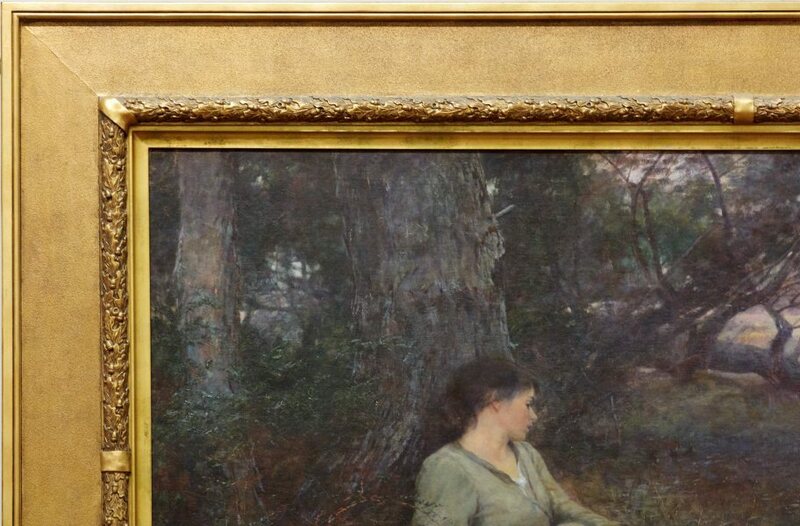 24] , 'The art of Frederick McCubbin and the impact of the first war', pg. 79-83, Melbourne, Oct 1979, 82. 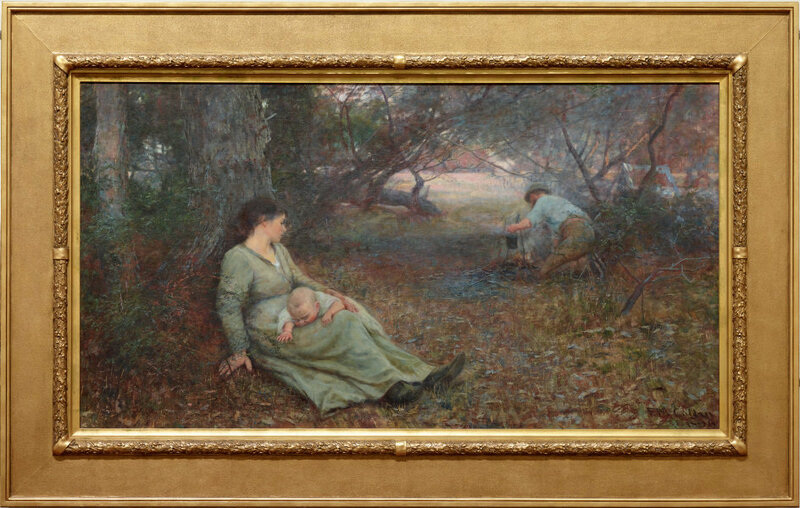 Dr Ann Galbally, This Australia , 'Classic painting: Frederick McCubbin', pg. 74-75, Canberra, 1982, 74-75 (illus.). Ursula Hoff, Meanjin , 'The phases of McCubbin's art', pg. 301-306, Carlton, Spring 1956, 303, 304. Bruce James, Art Gallery of New South Wales handbook , 'Australian Collection: Painting and Sculpture', pg. 102-181, Sydney, 1999, 122 (colour illus.). Suzanne McDonnell, The Weekend Australian , 'Artist's mystery pioneer revealed', pg. 4, Sydney, 06 Jul 1991-07 Jul 1991, 4. William Moore, The story of Australian art from the earliest known art of the continent to the art of today (Vol. 1) , 'National life', pg. 122-152, Sydney, 1934, 134 (illus.). Barry Pearce, Australian art: in the Art Gallery of New South Wales , 'Introduction', pg. 10-16, Sydney, 2000, 13, 37, 69 (colour illus. ), 302. Laura Pia, Look , 'Seeing art takes more than looking: Audio description tours now at the Gallery', pg. 12-13, Sydney, Jul 2009, 13 (colour illus.). Ron Radford, McCubbin: last impressions 1907-17 , 'Introduction: Fredrick McCubbin 1855-1917', pg. 9-20, Canberra, 2009, 10, 18, 36, 43. Jill Sykes, Look , 'Art, business and a Vatican contact', pg. 54, Sydney, Feb 2007, 54 (colour illus.). Art Gallery of New South Wales picturebook , Sydney, 1972, 86 (colour illus.). Australian painting 1788-1970 , South Melbourne, 1971, 88, 119. The golden age of Australian painting - Impressionism and the Heidelberg school , Melbourne, 1969, 91 (illus.). A catalogue of Australian oil paintings in the National Art Gallery of New South Wales 1875-1952 , Sydney, 1953, 138. The Sydney Morning Herald , Sydney, 10 Sep 1897. The Sydney Morning Herald , Sydney, 09 Sep 1897. Portrait of a Gallery , 'Australian Art in the Old Courts', pg. 24-37, Sydney, 1984, 33 (colour illus.). Art of Australia. Vol 1: Exploration to Federation , 'Individual and national feeling', pg. 545-610, Sydney, 2008, 568-569 (colour illus.). Australia: Studies of Society and Environment , Sydney, 1996, 162. In our own image: the story of Australian art , Sydney, 1995, 60 (colour illus.). Strange women: essays in art and gender , Melbourne, 1994, 102 (illus.). State of the arts , Sydney, Dec 1991-Mar 1992, 36. Frontier Country , Sydney, 1989, 130 (illus.). Art & the West , 'Mythmakers', Sydney, 1987, (colour illus.). AUS 4 card. Australian impressionist painters: a pictorial history of the Heidelberg school , Windsor, 1981, 80.